conducting the walk-in drive for the PMC Staff Nurse recruitment so candidates go through the details carefully. 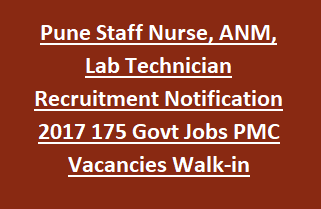 PMC ANM jobs Applied candidates for the PMC Staff Nurse Recruitment will be selected based on the performance in the interview. Candidates who are applied for the PMS Staff Nurse Jobs should not exceed 38 years. The PMC ANM Staff Nurse applicants of Pune municipality walk-in to the venue with the proper documents of academics and experience for the given on 25-09-2017 to 27-09-2017 to face Personal Interview.